Buffalo Bills is a brand of beef jerky made by Choo Choo R Snacks, Inc. out of Lebanon, PA. The company got its start in 1990, at a time when there was still a lot of chopped and formed jerky on the market. It was created by five snack food distributors that saw a market niche to fill by pooling together their collective resources. Since then it has grown to be named as one of the top 5,000 fastest growing companies by Inc. Magazine. This particular variety of "Premium Hickory Smoked" jerky that I'm reviewing is the one that launched the company. Beef, soy sauce, corn syrup, flavorings, cultured whey sodium nitrite. The first tastes that come through upon popping a piece into my mouth is the hickory smoke, followed by the natural meat flavors. The soy sauce flavor shows up soon after. I'd say the predominant flavor in this jerky is the natural meat flavors. It offers a great beef taste with that hickory smokiness. In fact as the package advertises this as "Hickory Smoked", it is in fact very smoky. I'm not an expert on smoke woods, but I've had other hickory smoked jerky, and this does have a similarity. The soy sauce flavoring is something you sense after softening up a piece and chewing it for several seconds. It's mostly noticeable as a saltiness. This jerky isn't overly "salty" by any means, however. And while corn syrup is listed in the ingredients, I don't really taste much sweetness at all. My close up photo caught some specs of black pepper here and there, but I don't really taste it. Overall, this is a very tasty, smoky, variety of beef jerky that emphasizes the natural beef flavors with some saltiness. The flavors all seem to last throughout the chew. These are cuts of real meat, sliced into medium thickness, and in small to medium sized pieces. 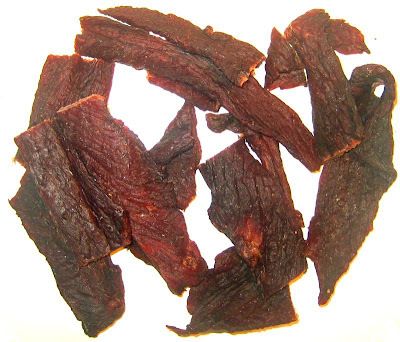 This is a dry jerky, one that retains a lot of flexibility. Tearing a apart piece requires some effort, but I wouldn't call this tough. Chewing also requires some effort as well, but just the same, I couldn't call it tough either. Someone not used to eating a lot of jerky might see this as tough, however. I found some chewy tendon (or some kind of membrane) on a couple of pieces. I noticed one small piece that appeared to be all fat, tendon, gristle with some pieces of meat in between. Otherwise, the rest of the pieces are void of gristle. One piece had nice spot of fat on it. Overall, the meat consistency is good. I'm not counting that small piece of fat-tendon-gristle since it was just that one small piece, and likely slipped through the quality check. Choo Choo R Snacks sells this variety on its website at a price of $5.49 for a 3.5oz bag. That works out to $1.57 per ounce, making this an average priced jerky. I'd say this offers a good value. You're getting a beef jerky that has a lot of natural meat flavors, with a good meat consistency, and a taste that lasts throughout the chew. As a hickory smoked variety, it lives up well to that claim. This Premium Hickory Smoked jerky offers the great taste of real beef, a tasty hickory smokiness, and a soy sauce flavor, which gives you a trio of flavors that lasts throughout the chew. Combine that with its good meat consistency, and you have a very snackable jerky. But that trio is a pretty familiar combination that beef jerky afficionados have experienced all too often. If it could add one more taste dimension, perhaps more sweetness, more garlic, or more black pepper, I could give it a best rating. I wouldn't mind it being a little more easier to eat. 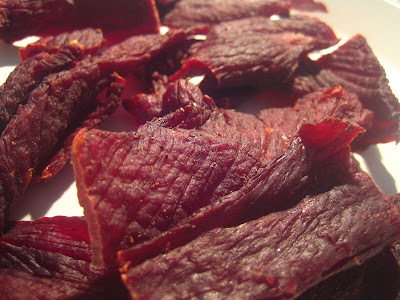 Otherwise, if you want a beef jerky that puts emphasis on being smoky and retaining the natural beef flavors, kinda like how "Buffalo" Bill Cody might have made it himself, this is it.